Who wouldn’t like a little fun in their lunchbox? Or bento box? 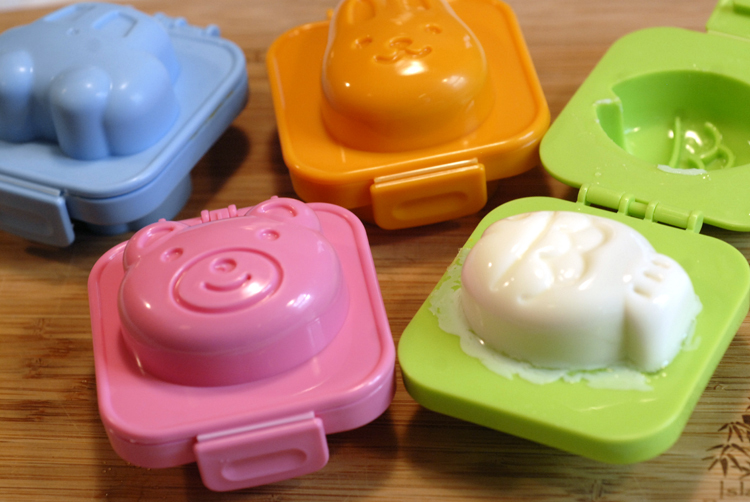 These cute egg molds are from Japan made by Kotobuki I purchased through Amazon. There aren’t any instructions that come with the molds and the packaging is in Japanese so I had to do a little research. Once you’ve boiled your eggs, you peel them under cold water right away and gently squish them into each shape, snapping it shut. 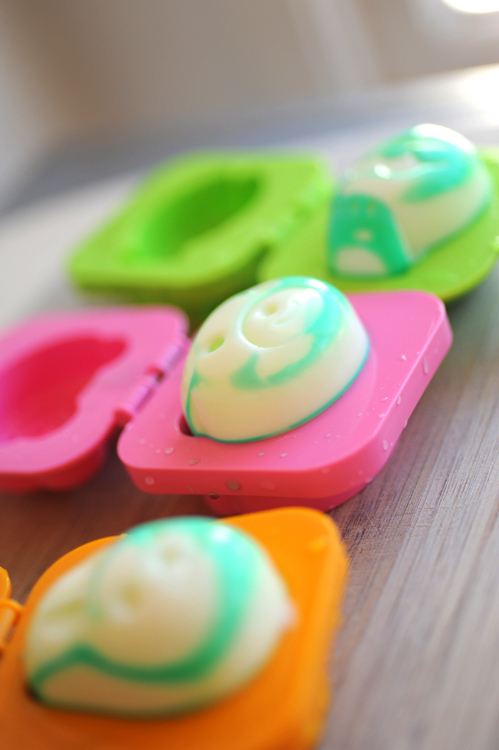 You can then place them in cold water that has been colored with food dye giving the egg a kind of tie-dye effect. This might be a little creepy for little ones. I used green because that’s all I had. It looks a bit like mold, I think. Next time maybe I’ll go for purple or another color that is more appeeeeeling – get it? Ok, painful I know. I’ll get a vote on this very important topic when the grand kids arrive. This entry was posted in appetizers, recipes, sides, treats and tagged boiled, children, easy, egg, fast, healthy, lunch, school by MixedSoup. Bookmark the permalink. Eggxactly the right way to encourage little ones to enjoy golden parcels of protein I wonder if could flavor the food coloring??? Vet cool photo effects. #2 How did the gnocchi come out!?! Aren’t they cute? I have little soft-boiled egg cups that I need to post. What is up with the chicken and the egg posts all the time ;)? Emily, I’ve made the gnocci (surprisingly easy) and will be having it for lunch today. I’m sure your recipe will be fantastic; I’ll let you know! Thanks again. How ’bout a Captain Jack update?